Our Fundraiser for Shielia Winfrey's Liver Transplant raised $2000. 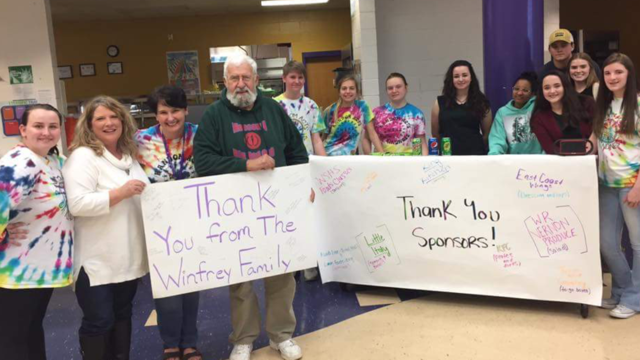 The Random Acts of Kindness Club at West Stokes High School is part of a larger organization called the Random Acts of Kindness Foundation, which has clubs all across the country at high schools, colleges/universities, and in communities. We strive to ﻿make a difference﻿ in the lives of others, with our words and deeds. We hope to promote an atmosphere of kindness, happiness, and unity in our school and community and to inspire others to join our movement. please speak to Mrs. Mabe in Room 119. These inspiring clips (below) are from the Random Acts of Kindness Foundation. It's awesome to see how much people can make a difference in the lives of others. and the greater community of King!